Dermalastyl is a collection of anti-aging products designed to prevent wrinkles, laugh lines, brow lines and sagging skin. 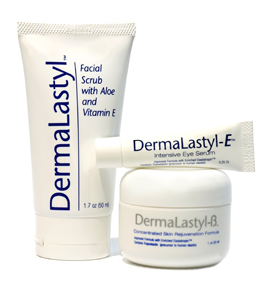 The Dermalastyl line of products works to reverse the loss of elastin and reduce the appearance of existing wrinkles while preventing new ones. As a result, a number of people rely on Dermalastyl as an alternative to Botox. The complete line of Dermalastyl products includes DermaLastyl-β™ Skin Rejuvenation Formula, DermaLastyl-E™ Intensive Eye Serum, Dermalastyl-βx™ Pro Face Formula, and Dermalastyl-Ex™ Pro Eye Formula. According to the makers of Dermalastyl, its elastin-preserving qualities are attributed to the inclusion of its main ingredient, Tropoelastin. Tropoelastin supposedly supplements elastin levels in the surface of the skin, and diminishes the appearance of current wrinkles while preventing the formation of new ones. According to the manufacturers of Dermalastyl's line of anti-aging solutions, their creams and serums are the only products which include this ingredient. Other active ingredients include Matrixyl-3000, Argireline, Hyaluronic Acid, and Prolisel. Clean your skin and pat dry. Using a circular motion, gently massage DermaLastyl-β™, DermaLastyl-E™, Dermalastyl-βx™, Dermalastyl-Ex™ Pro into the desired areas until it's completely absorbed. Apply sparingly twice a day. Dermalastyl seems to have a pretty impressive concept in its use of Tropoelastin as it contains more than 600 amino acids. However, the concentration of other filler ingredients in it Dermalastyl's formulas leaves us wondering whether it contains enough Tropoelastin to really be effective. Plus, the company who markets the Dermalastyl collection offers a free trial with enrollment in its auto-ship program. In our experience, auto-ship programs are extremely problematic and can be difficult to cancel, so they should be avoided at all costs. If you choose to try any product in the Dermalastyl collection, we suggest you simply place a single order so you can avoid being automatically billed in the future for additional order you may not want. Looking for a wrinkle cream that works? We've reviewed the leading the anti-wrinkle creams and compiled all the information for you. Dermalastyl™ is a trademark of DermaPlus, Inc.
All information is accurate to the best of our knowledge at the time of publication.